Many people believe in the misconception that martial arts only serve to increase the aggressiveness of a person. Sure enough – it seems logical. You will need to kick and do some boxing in most martial arts. And this is an outlet for aggression. But the fact of the matter is that martial arts will help you deal with repressed feelings of aggression better than anything else. We have all had times when we were so mad that we thought that we could break down the wall. Well, if you knew how to utilize and expend this energy properly, then you will have trained Muay Thai. By training the sport of Muay Thai, you will do several different things. The first and most important thing is that you will be facing a fear that most people have issues with – the fear of violence. It’s strong, this fear. If you get gripped by it you will end up losing a lot in your life by constantly doing compromises. It’s entirely another thing to be able to face violence and look it in the face. This will make you a lot stronger and more powerful than ever before. But it will take time. You may see that it’s very difficult for you to start training Muay Thai. Every training session will seem like you’re climbing a mountain. But persist and this feeling of incompetence and exhaustion will begin to decline. You will build up not only your skills but also your confidence. And this is one of the most important things that you could do with yourself. You’ll also get to meet new people. It’s easy to strike up conversations with people that you train with. If for nothing else – then talking about Muay Thai is always the fail-safe option. If you ever feel lonely, then you will have the perfect opportunity to get past this feeling and train Muay Thai. 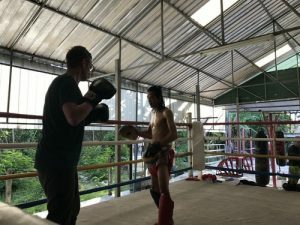 There are so many ways in which Muay Thai can help you in becoming a better person that it would take a whole book for us to count them all. All we hope you do is give Muay Thai a shot in order to see what it’s all about.